And so, the partial move to the retirement house has begun. When we went for Christmas 2016 to our Arizona retirement place, our team of 2 had a plan: 3 big suitcases each of winter clothes and field gear that rarely gets used in Houston. I would handle guarding the 6 bags curbside, while my husband went to fetch the rent car via the rent car bus. If that sounds hick, well, it kind of is. Once we got back to Houston I had visions of repeating this process in March. After all, I grew up tough in the Rockies, choppin’ wood in the snow and catchin’ fish with mah bare hands. I will go solo to meet with a lady to arrange painting the inside from orange to grey in 1Q prior to us visiting and let the place air out. I began to sort my spices. The enormous bag had 10 jars of paprika, cayenne, and other assorted “meatball elixir” spices. I wondered if there would be signs at the airport akin to the Nexus 7 phone stating the following: “Cayenne prohibited because of fire danger, watch out for George near the Exits”. And the bag weighed a ton. 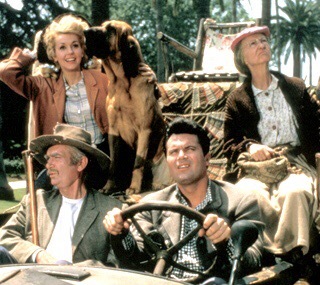 (For my foreign readers, The Beverly Hillbillies was a show popular in the 1960s and 1970s). It portrays a backwoods country family that discovered oil on their land, made millions, then moved to Hollywood. They call pools “CEment ponds” and animals “critters”. I realized that hauling spices is silly, especially when I get that “no wife of mine is gonna suffer no more” look from Mr W.
I’m not 25 and scrubbingly poor anymore. Instead of spices, I will take the rest of winter clothes and other light, bulky stuff we won’t need for the next 5 months or so in Houston. After all, it’s nearly February-that’s Springtime in Houston. Plus I’ll bring my bathing suit.